What’s needed for effective strabismus treatment? The three keys listed in this post are all based on a single premise: We must get the eyes to both look at the same place in space. Unfortunately, when you look closer at the treatment provided for many strabismics, you find this is not always part of the treatment plan. More people are concerned about the appearance of the eyes, and the default option for many parents and ophthalmologists is to operate on the eye muscles. With strabismics, however, the two eyes aren’t working together, so you need to address this underlying problem for a functional change to occur. “It’s really about space perception,” said Dr. Kellye Knueppel. Strabismus occurs when the brain processes spatial information from the two eyes differently. When the brain can’t combine the two images into a single 3D image, double vision will occur. This results in confusion and difficulty performing many tasks in daily life. To solve this confusion, the brain needs to learn to suppress (ignore) one of the images or figure out how to get one of the images out of the way. The second image can get out of the way if the eye turns in, out, up or down, or some combination. Correcting the eye turn involves finding a way to get the eyes to see an object in space the same way. For example, if one eye is far-sighted and the other is not, there will be a difference in how they process spatial information. 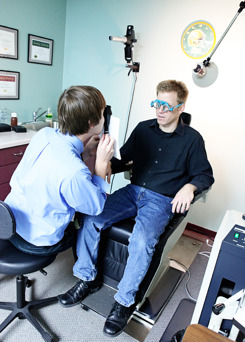 To get the eyes to see the same object in the same way, a developmental optometrist’s treatment for strabismus will typically begin with measuring each eye’s movements and how their respective focusing systems work. Even if the patient starts to use the two eyes together, that does not mean the person will be good at it. 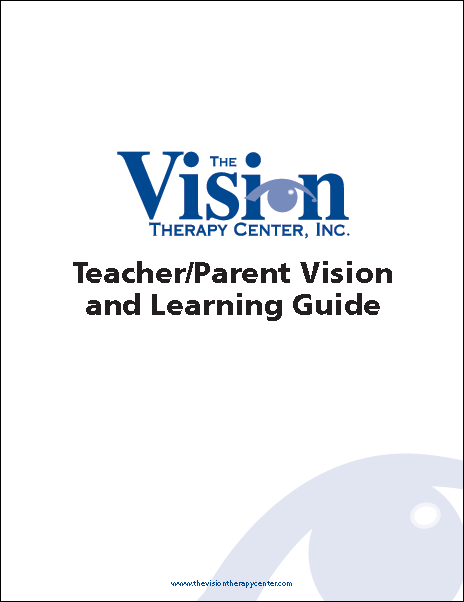 However, he or she will start to work on activities in their vision therapy program to help the person become more effective at the visual skill. The next phase of treatment involves getting the brain to pay attention to the strabismic eye information while the other eye is open and able to see. In most cases, there is one eye that turns more frequently. If the person cannot actually point both eyes to the same place in space, we may have them practice trying to mainly look with the strabismic eye or use red/green or polarized glasses to help them know with which eye they are fixating. They will have to consciously try at first. The goal is to eventually automatically look and process information with either eye easily. With practice, the brain can usually learn how to pay more attention to the strabismic eye even when both eyes are open. When this occurs, it then becomes much easier for the patient to start using both eyes together. Most people don’t realize that peripheral visual processing is extremely important for binocular vision (using both eyes together) and for depth perception. Because of this, a great deal of treatment for strabismic patients in vision therapy focuses on improving the function of peripheral vision. You are always using both pathways and they communicate with each other, but for most activities either central or peripheral vision may be more dominant. For example, when reading you will primarily be using central vision to see the letters and words clearly and concentrate on comprehending the words at which you are looking. You will use peripheral vision to move to the next word, jump from line to line and begin paying attention to upcoming sentences and paragraphs. In addition, a smaller amount of attention will be on using peripheral vision to pay attention to what is going on around you while reading. People who cannot do this are easily frightened by someone else walking up to them while they are reading. Alternatively, they can be distracted by what is going on around them and cannot read at the same time. Peripheral and central vision also work together when you’re walking. As you’re walking, you primarily use peripheral vision to process all the objects around you to decide where you are going. You may use central vision at the same time to read a sign or look at and talk to another person coming toward you. Too much attention to central vision will lead to tripping, walking into furniture, other people or even into walls! People with functional vision problems -- especially strabismic patients -- often have great difficulty using central and peripheral vision at the same time and balancing how much attention their brain needs to be paying to each type of vision. “This is why while under stress most people tend to shut down their peripheral vision,” Dr. Knueppel said. She notes that these people will be concentrating so much on what they are looking at that they can’t pay attention to the rest of the world around them at the same time. Why is this so important in treating strabismus? Because the peripheral vision is needed to process the spatial information to help the person point both eyes at the same place. If the central/peripheral parallel pathways are not being used effectively, it can be a huge barrier to success in treating the patient. Getting each eye to function as equally as possible. Once these skills are in place, then it’s a matter of practicing using both eyes together at different distances and doing different activities. Eventually, this will allow for comfortable and efficient use of both eyes at the same time. The exact vision therapy activities used to treat strabismus and the duration of the treatment will vary with each patient. To determine if you could benefit from this approach, begin with a Functional Vision Test to isolate the specific vision problem.